Rossi, P. H. Introduction.--Williams, W. Cleveland's crisis ghetto.--Boesel, D. and others. 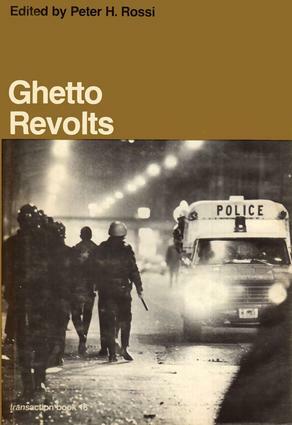 White institutions and Black rage.--Conforti, J. N. Newark: ghetto or city?--Schuman, H. Free will and determinism in public beliefs about race.--Parmenter, T. Breakdown of law and order.--Rainwater, L. Open letter on white justice and the riots.--Dynes, R. and Quarantelli, E. Looting in American cities.--Knopf, T. A. Sniping: a new pattern of violence.--Lipsky, M. and Olson, D. Riot commission politics.--Rosenthal, M. Where rumor raged.--Blauner, R. S. Whitewash over Watts.--Greer, E. The liberation of Gary, Indiana.--Barbaro, F. Newark: political brokers.